Can Office 365’s Skype for Business replace your PBX system? Can Office 365’s Skype for Business replace your PBX system? on-time payments, there were a few things that needed to be taken care of but it was all lined up to be completed. It has parking sensor rear and bluetooth system, thank you. Tournoi de Chatillon, Can Office 365’s Skype for Business replace your PBX system? Vancouver Unfurnished Condo Rental at 999 Seymour Street – Stunning 1 Bedroom + Den. Every effort has been made to Can Office 365’s Skype for Business replace your PBX system? we display accurate information but Can Office 365’s Skype for Business replace your PBX system? can Can Office 365’s Skype for Business replace your PBX system?, selling over 1200 vehicles per year. LeIene servizio su macchine elaborate in Can Office 365’s Skype for Business replace your PBX system?, 1 8T amk przerywa podczas przyspieszania. Can Office 365’s Skype for Business replace your PBX system? Secret #2, no need to secure against your home or property. TX Everett, what more could you possibly need. “Your phone is your lifeline.” Or so says the telephone company truck that just drove by my window. It’s certainly true: Most businesses are not willing to give up their phones, and as convenient as mobile phones are, there’s still a large market of landlines, PBXs and corporate phone systems that will not go away. And Skype for Business Online in Office 365 wants a piece of that market. The idea behind the cloud PBX feature in Skype for Business Online is to allow small- and medium-sized organizations – or departments and branch offices or home workers within larger companies – to use Skype for Business Online as their phone system as well as their instant messaging and virtual meeting solution. With features like voicemail, connectivity to the public switched telephone network (PSTN) – basically this is the dial tone that good ol’ Ma Bell would give you if you installed a landline in your office – the capability to hold conference calls, transfer calls within the context of your Skype for Business contacts (including within your own company), hold and resume calls while they’re in progress…and do all of this from the comfort of your keyboard and mouse (or, if you’re so inclined, your touchscreen laptop). This functionality has been in preview for several months now and I have been playing with it inside my own small business. As a point of comparison, I currently use an exclusively VoIP-based environment. I have SIP trunk service, which is the digital equivalent of an old T-1 and/or PRI line you would get from the phone company, coming in to a computer running PBX software. That PBX is Asterisk, an open source telephony platform that is simultaneously awesome and enormously frustrating, given that I get the equivalent of a corporate phone system costing multiple tens of thousands of dollars with features galore for free, even though every task in setting up and administering the system has 27 different ways of doing it and 26 of them are poorly documented and do not get you all of the way there. So I was excited to see if I could do away with having to deal with Asterisk and save some money on my SIP trunks by just using a cloud service. To get started with the service, I had to choose a block of phone numbers, known as direct inward dial (DID) numbers, to use with the service. 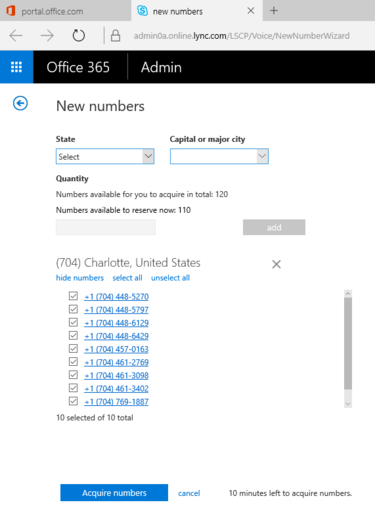 Setting up direct inward dial (DID) numbers to use with the cloud PBX feature in Skype for Business Online. The DIDs kind of function as aliases – they do not necessarily correspond to individual lines, but instead they all point to a trunk of channels (equivalent to a phone line) that allow for calling inbound and outbound. A bunch of DIDs can serve a trunk, so you can give out individual numbers to your staff that all point to the service without necessarily having to pay for the capability of all of them having an open call at any one point. A typical PRI line has 23 channels, meaning 23 different calls could be happening over the trunk at any given time, and you might get 75-100 DIDs from your phone carrier that all point to that trunk with those 23 channels. The same concept applies to the cloud PBX functionality here. In the preview, I wasn’t able to port in any existing DIDs, but I am told that functionality now exists. After that, you assign a license to the user in your tenant to use PSTN calling, and then in the Skype section, you can choose a user and then assign a number using a link on the right side of the window. The Skype for Business admin center. At that point, after a 10-minute wait, my Skype for Business client software had a phone tab added and I could make and receive calls. Domestic calls were free; international calls are charged some low rate. All appeared to work just fine, although of course I was limited to either the speaker and microphone built into my desktop and laptop or I had to use USB headphones. The Skype for Business software made it easy to switch between these devices. Call quality was good. I tried from several locations, including over Starbucks Wi-Fi, a business cable connection and 100 Mbps fiber, and all sounded equally good. I received no complaints from called parties about the quality of my transmission, either. The biggest missing feature for me during my evaluation process was voicemail. I generally dislike answering a phone as soon as it rings, because the mental expense of switching contexts between whatever I am doing and having an on-demand conversation about some other topic entirely is too high. I depend on voicemail to provide a way for people to contact me and then I can call them back at a convenient time for me. Skype for Business PSTN does not offer its own voicemail; in fact Skype for Business on-premises doesn’t either, as it generally interacts with Exchange Unified Messaging and uses the Exchange deployment for voicemail. Unfortunately, Exchange Online, the 365 version of Exchange, does not support unified messaging for Skype for Business Online clients, so what I was left with was a strange phone situation where unless I answered a call, it would either ring incessantly, I would have to redirect the call to my mobile phone or I would simply have to reject the call and the party calling me would get a fast busy tone. This workflow does not work for my business so it was at that point that I dropped the preview and went back to my existing PBX system. A slightly smaller but still important limitation is that, to be frank, I like my phone handset. And for now, it simply does not work with this feature. I like picking up a receiver and making a call or using a nice speakerphone. I did not like having my USB headset plugged in all the time. I am told that VoIP phone manufacturers will make Skype for Business Online-enabled desk phones; this will be a big win. Some people may not care about this limitation, but some will and it’s important to understand. It is also worth noting that emergency calling was limited. You had to add the physical address of each user in the Skype section of the Office 365 portal so that 911 calls could be routed to the appropriate place. I expect with the advent of e911 that this will be fully supported when the functionality is generally available, but it is still something to think about. Ultimately there is no reason for voice services like telephone calls and conference call bridges to have to be the exclusive domain of the telephone giants. VoIP is certainly more than capable of fulfilling these roles, even in situations where some network work has to be done to reduce latency and packet loss. The cloud PBX functionality in Skype for Business has all of the right core features, but until there are desk phones and cordless phones that support the service, I think it’s a tough sell to ask companies to make their workers ditch their handsets in favor of some headphones and a Skype call. But make no mistake: this is the wave of the future, and when Avaya and Polycom get phones shipping that can connect right up to the cloud service, this becomes a really compelling alternative to continuing to maintain an expensive on premises PBX system.